Most Medical Equipment In Low-Income Countries Is Donated. And Most Of It Doesn't Work. : Goats and Soda Around 80 percent of medical equipment in low-income countries is donated. And most of it doesn't work. 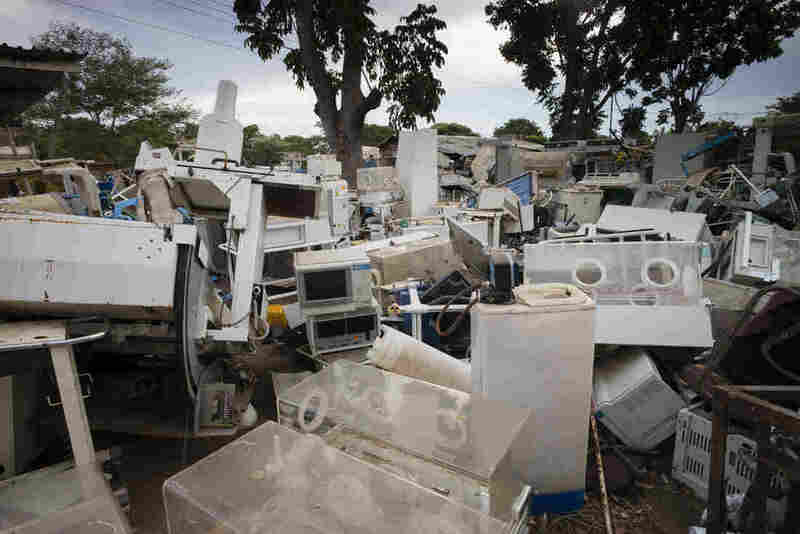 A dumping ground for old medical equipment in Malawi. "Oh, we have a hematology analyzer but it stopped working," the lab technician said as he pointed to a covered tabletop medical equipment in the corner used to measure blood count levels — an important but simple tool for a community where anemia and infections are prevalent. The busted hematology analyzer, which I encountered during a visit to a hospital in the rural Kono district in Sierra Leone, has plenty of company in the hall of nonfunctional medical equipment. The landscape of the West African countries I've worked in — not only Sierra Leone but also Liberia and Nigeria — is strewn with broken machines. Sometimes they bear the name of the nonprofit group or aid agency that made the donation. I've seen the same problem during two stints in a rural Nicaraguan hospital in 2005 and 2008. Indeed, the scope of the problem is immense. To start with, WHO estimates that 80 percent of the medical equipment in developing countries is donated. A 2011 study looked at inventory lists from 16 low-income countries and showed the number of nonfunctional medical equipment in that pool is at about 40 percent. (Take this with the caveat that most places I have worked do not have up-to-date inventories). Meanwhile, in high-income countries less than 1 percent of medical equipment is out of service. When medical equipment breaks down in the developing world, it often stays broken. There are usually few supply chains to get replacement parts, and local technical expertise is sparse. Even when the machinery isn't broken, it may not be useful. In some cases, the donated machines need voltage that is incompatible with the electric supply (if it's available and consistent) in the target country. Or the machine itself may work but the supplies needed to make it work may have run out. I have also noticed that there is often a mismatch between the equipment donated and the capacity of the health-care facility to actually use the machine. What good is a ventilator when you donate it to a facility that has no health care workers with training to use it or steady electricity to keep operating it? An old but often quoted report by WHO on medical device donations states: "Only 10–30 percent of donated equipment becomes operational in developing countries." Invariably, the rest end up in hospital corridors or patient rooms or litter the outskirts of villages. Sometimes they become playthings for children. Can anything be done to revive the broken machines — or at least make sure that new medical equipment doesn't fail as well? A first step would be to do what you do when you want to make sure you give the right gift to someone — ask what they need. Better communication between a donor and the recipient country can help ensure that the medical equipment is appropriate to the setting, safe, cost effective and easy to maintain. A Tropical Health & Education Trust (THET) report states that the appropriate selection of medical equipment could result in savings of up to 90 percent on the operational and maintenance cost over the lifespan of the equipment. Then there's the matter of upkeep. Donated equipment has hidden costs. Sheila Davis, the chief nursing officer and director of West Africa programs for the nonprofit organization Partners in Health, said, "We need the full package with that equipment [and] initial and refresher retraining for the staff on the proper use and troubleshooting. And the last often forgotten element is maintenance of the equipment." THET estimates these additional costs at about 10 percent of the purchase price per year of operation. But many biomedical companies generally don't offer regional technical support in low-income countries, and service manuals are missing, not user-friendly or not shared by manufacturers for intellectual property reasons. So fixing up a donated machine may turn out to be impossible. "Many times the machines have just been phased out and are no longer supported by the company," said Lloyd Jenkins of International Aid, an organization that offers technical support and advice to nonprofits seeking medical equipment for their operations abroad. Offering a short training program can make an immense difference. A project run by Engineering World Health (EWH) in Rwanda, funded by the GE Foundation, showed that after trainings in hospitals, the number of out-of-service equipment fell by almost half. But WHO's 2015 survey of such programs, for example, shows there isn't even one in the three West African countries recently affected by Ebola — Guinea, Liberia and Sierra Leone. Another solution would be for health ministries and hospitals to procure medical equipment themselves with the aid of international funding agencies. That way issues about warranties and technical support could be worked out directly. In this approach, donors may invest more money upfront. But contributing money instead of equipment could prove more cost effective over the long term. Direct buying by ministries of health is a growing trend, says Dr. Muhammad Zaman of Boston University's School of Engineering, who has been working on these issues for over a decade. "The issue is often [about] the time it takes [to buy directly]. And even with contracts eventually you need local repair." It's not a perfect solution, says Zaman: "The number of people trained is also small." And in the end, the lack of reliable supply chains for parts remains a major issue. Currently only 13 percent of medical device manufacturers are located in low- and middle-income countries. But places like sub-Saharan Africa are starting to look like attractive markets for biomedical companies, and 9 out of 10 top manufacturers listed expansion into emerging markets as a priority in recent annual reports. Just because a country is low-income does not mean it is no-income. The African pharmaceutical industry, for example, grew from just $4.7 billion to $20.8 billion in a span of 10 years ending in 2013, according to a report by McKinsey & Company. Lastly, technological innovations in the form of "frugal technologies" can play an important role since they can sometimes be easier to use, contain very few components and bypass many structural issues that lead to unusable medical equipment. That phrase refers to equipment that's adapted to the local environment and developed with users. Ranging from portable infant incubators to solar-powered ultrasound machines, these devices provide immediate solutions to many health issues, particularly in remote areas. Although the future holds promise, the issue of broken medical equipment leaves me uneasy because it is a literal and figurative representation of the power differential between the donor and recipient. Many poor communities accept donations regardless of what they are due to dire needs and not wanting to look a gift horse in the mouth. But the sheer waste speaks loudly to the importance of engaging health-care workers and other members of low-income communities in the decision process.